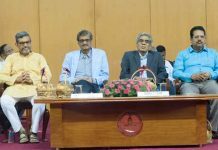 Thiruvananthapuram: The annual convention of the Institute of Company secretaries of India is celebrating this years convention as Golden Jubilee Year National Convention of Company Secretaries (45th National Convention). 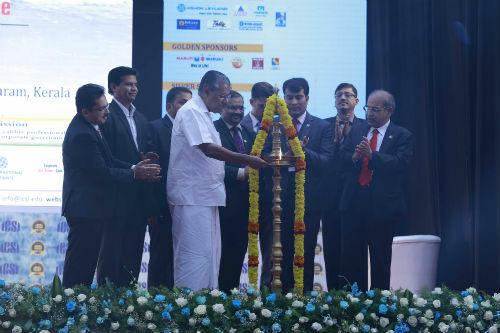 The spectacular event had a grand opening and was inaugurated by the Hon’ble Chief Minister of Kerala, Shri Pinarayi Vijayan in Thiruvananthapuram today. Amongst the august gathering present at the inauguration were Sadhguru, Founder, Isha Foundation and Shri B K Modi, Founder Chairman, Smart Group besides leading CEOs and CFOs of leading corporate houses of the country and accomplished professionals from across India. In keeping with the Prime Minister’s vision of New India 2022, the theme of the three-day annual convention is “COMPANY SECRETARY: SHAPING NEW INDIA 2022 THROUGH GOOD GOVERNANCE” where the deliberation will focus on expanding its vision `from ‘good governance’ to ‘national governance’ over the three days. Hon’ble Chief Minister of Kerala Shri. Pinarayi Vijayan graced the occasion as the Chief Guest and released the ‘National Convention Souvenir’. While inaugurating the Golden Jubilee Year National Convention of Company Secretaries (45th National Convention), he congratulated ICSI for attaining institutional excellence and being a torch bearer for the cause of Good Corporate Governance for the last 50 years. He also appreciated the selfless contribution and dedication of the institute and its stakeholders towards shaping new India 2022 through good governance. CS (Dr.) Shyam Agrawal, President, of The Institute of Company Secretaries of India (ICSI) said, “At ICSI, our efforts have always been to redefine the way our corporate practices are undertaken, specifically with stress on improving corporate governance norms. The Institute has pioneered the conceptualisation of the ‘International Corporate Governance Code’ and envisions to play a lead role in corporate governance”. He further stated “Since inception, ICSI has grown tremendously as the only recognized professional body in India to develop and regulate the profession of Company Secretaries. The Golden Jubilee Year National Convention of Company Secretaries (45th National Convention) will discuss the basic tenets of achieving zero tolerance by adopting good governance practices for a pragmatic and progressive outlook of any company. ICSI President during his address also stressed upon the Green protocol – A major movement in Kerala which defines the form of an enviro-cultural revolution. This movement is instrumental in changing the way we live in this Country and on this planet. The 3 day convention will focus on contemporary themes such as Insolvency and Bankruptcy Code 2016, GST-Good and Simple Tax, Life Skills, New India-New ICSI, NCLT and Governance from Ancient Indian Scriptures. Shri B K Modi, Founder Chairman, Smart Group also graced the occasion and emphasised on the Role of Company Secretaries as Governance Professionals who can lead India into becoming a world leader in terms of ease of doing business. Also, he has stressed that Corporate secretaries has to align themselves to manage disruptions coming to corporate sector via changing technology. Major publication like Charity Code of governance was release during the event.